The Rat Pack Trio Orchestra. This has to be the most fun show available today. Successful at major venues & stadiums worldwide. Superb backing tracks by the likes of Nelson Riddle Orchestra. If the live band is not feasible - then this is the show for you. Solo show with excellent backing tracks covering great Rat Pack songs by Frank Sinatra, Dean Martin, Sammy Davis & other Vegas greats plus Wayne blows some live tenor saxophone on solo gigs. Make no mistake - this is a very special enhancement of the show In fact, its probably even better than winning the lottery !!! We have several ladies we can feature - all have excellent voices. They also add a touch of glamour and style to our swingin party. For the big stage production - they are the finishing touch. Stunning outfits in beautiful colours that never fails to appeal. Here are of some of the dancers that we can use in the show. on an amazing trip that is yet another spectacular show addition. Pre event video production is also available for a one off event. NOTE: THE PRODUCTION OF ALL THESE OPTIONS AVAILABLE remains the same and to the high standard that we are renown for whether you book the most affordable or the most expensive show. Successful shows and rave reviews all over the world. all cleverly combined to guarantee a wonderful time. Currently selling out theatres, casino's and events worldwide. are just some of the countries to benefit from great times !!! As featured on TV in many of the great swingin nations above. Marilyn Monroe in a prolific slice of pure magic. smart move - you have come to the right place baby. 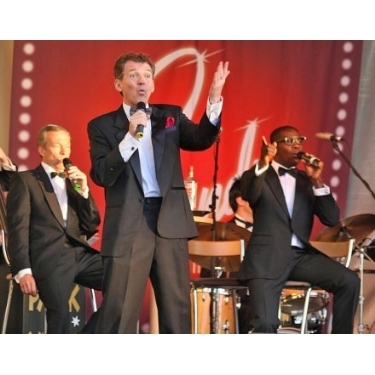 get a quality show and truly fitting tribute to The Rat Pack. we are never biased or prejudice in any way shape or form. we are prepared to accept large bags of cash from anyone. with an abundance of class, style & stunning panache. back to unforgettable halcyon days of hip and cool! Life's A Ball If Only We Knew It And Its All There Waiting For You. millions of other things at the same time. he manages to take most things in his stride. to indulge in his passion for playing tenor saxophone. around the globe including over 200 trips to the USA. Loves the Trio dates because playing Dean is such fun.